Try Vaporizer Ice Melt Flake when your needs dictate a fast acting, long lasting deicer. 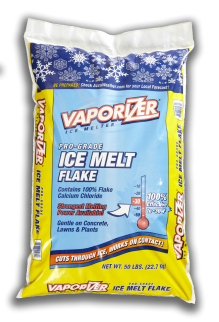 Try Vaporizer Ice Melt Flake when your needs dictate a fast acting, long lasting deicer. Vaporizer Ice Melt Flake is a preferred deicer because it is fast acting, long lasting, works at low temperatures and is hygroscopic. Because it draws moisture from the air, there is no need to mix with water and it is good for dust control. It is also environmentally safer than rock salt. Rock Salt & Ice Control HQ (a Duke Company) provides fast delivery for bulk or bagged deicers; in addition to expert advice, excellent customer service and the best values – look no further than Rock Salt & Ice Control HQ. We pride ourselves on meeting your winter needs with superb service and extensive knowledge and advice regarding snow and ice removal products, heaters and equipment. About the Duke Company Since 2004, the Duke Company has proudly been serving Ice Control professionals throughout New York state with exceptional pricing, outstanding ice melter products, prompt delivery and outstanding customer service. Call the Duke Company at 585-292-9870 (Rochester NY) and 607-347-4455 (Ithaca NY) for all your snow and ice removal needs and information. Peladow Calcium Chloride Pellets in wholesale, bulk, pallets or by the bag! Is Mr. Magic Premium Ice Melt Magic or Simply a Complete and Highly Effective Deicer?